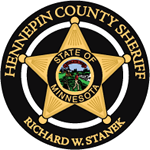 Turns out the building I’m looking for also houses the holding jail, but I’m heading there to attend the Hennepin County Sheriff Office’s Citizen Law Enforcement Academy instead. The academy is a six-week course offered free of charge to anyone who is interested in learning how law enforcement and the criminal justice system work. “You’re probably going to learn a lot tonight. A lot,” the uniformed lady says before she points me in the right direction. After being herded through a metal detector, our group of thirty is escorted upstairs into a classroom. Four of my classmates are fellow Twin Cities Sister in Crime members: Theresa Weir, Kristin Lerstrom, M.E. Bakos, and Midge Bubany. Also present are Midge’s husband/chauffeur, Tim, and a friend from my mystery writing group, Rose Stanley-Gilbert. A female deputy tells us they’ve had several crime writers take this course including Sister in Crime’s own Julie Kramer. It seems we’re in good company. Tonight, we’ll be hearing from Sheriff Richard W. Stanek and several departments in Investigations including Criminal Information Sharing and Analysis (CISA), Detective Unit, and the Violent Offender Task Force (VOTF). Some of the officers seem to get a kick out of having crime writers in the audience. 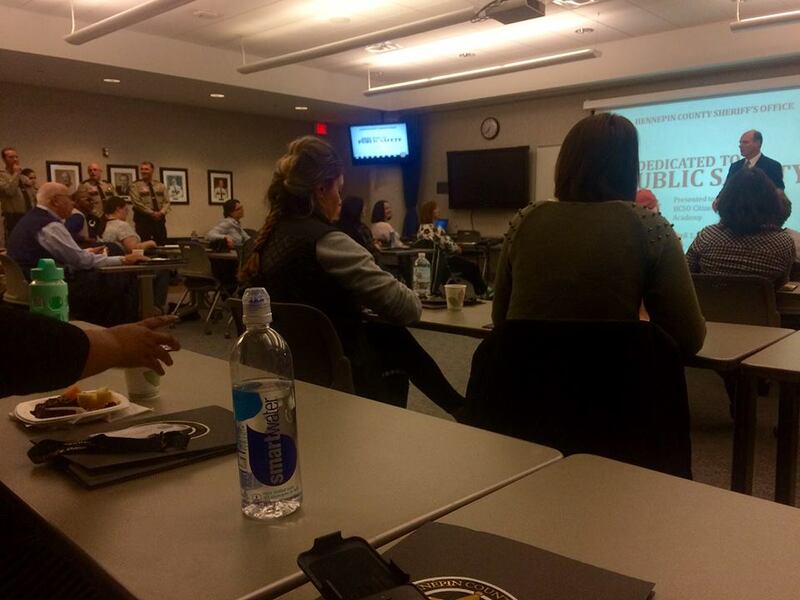 The highlight of the evening is a presentation by two officers assigned to the Violent Offenders Task Force (VOTF). Comprised of deputies from the Sheriff’s Office and from some of the higher-risk cities within the county, VOTF works with data analysts in CISA to identify both crime trends and the most dangerous criminals in Hennepin County at any given time. Since they work undercover, I’ll refrain from describing the VOTF deputies other than to say they are a writer’s dream come true. I’d love to take the deputies’ quirky looks and personalities and just drop them —plop– straight into my story. -VOTF is a young person’s game. Eventually, you will age out of VOTF, probably after five years. -They wear normal clothes and drive unmarked cars. They are nic-certified, meaning they can field test for narcotics. -They have some cases that are assigned to them but in general they get to create their own investigations. -Their work usually involves busts where they find “a couple of guns and some drugs”. -It’s hard work to cultivate informants and yes, informants are as annoying as you’d think they’d be. It’s a rhetorical question, right? At the end of their presentation, the VOTF deputies allow us to handle confiscated weapons including an AK-47. We also get to try on bullet-proof vests. I wish I could have taken a photo of the SinC members wearing those vests, but photos were forbidden due to the sensitive nature of the VOTF deputies’ work. I hope we can get a group picture soon. As the lady in uniform predicted, I learned a lot. Can’t wait to see what week number two of the academy will bring. Next > The AWP Conference: Is It For Crime Writers?